To streamline the user experience, I recommend that you set these options as appropriate for your environment and disable this prompt from appearing to the users. This will ensure uniform settings in your deployment environment, and eliminate questions (and wasted time) from users who do not know what setting to choose. 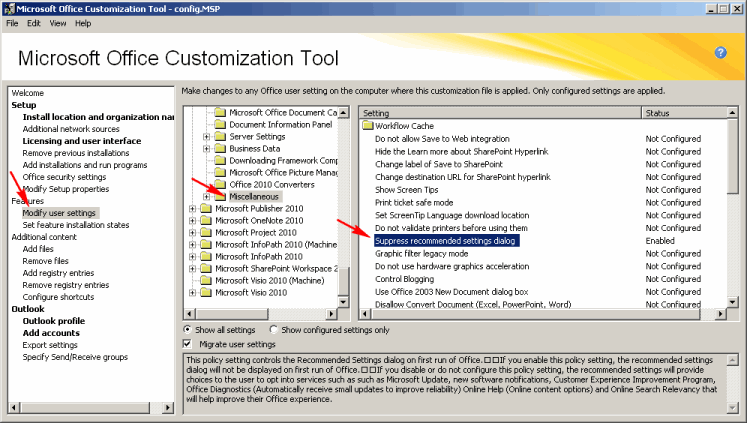 You can suppress this dialog box by using the Microsoft Office Customization Tool. To use this tool, copy the contents of the Office 2010 CD to a network-accessible location, and then open a command prompt and run "setup.exe /admin" in that location. Then navigate to Modify user settings -> Miscellaneous -> Suppress recommended settings dialog. While you're at it, I recommend that you do NOT show the completion notice (accessible under Licensing and user interface). The completion notice is shown to end users before the required reboot. So if you deploy Office while nobody is logged in, the next person who logs in will be notified that Office 2010 has been installed and THEN they will have to restart the computer. This would cause another waste of time.